The New Social Worker Online Blog: Welcome to Summer! Hello! We have been away from our blog for a while, so I would like to take this time to welcome you to summer! I realize that our readers are in various parts of the world, and it may not be summer where you are. Still, this is the time of year that our SUMMER issue of THE NEW SOCIAL WORKER magazine is published! 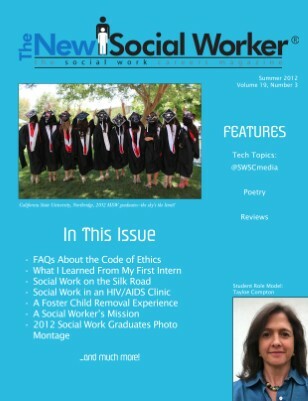 The Summer 2012 issue of THE NEW SOCIAL WORKER magazine. This issue includes articles on: FAQs about the Code of Ethics, learning from my first intern, social work in an HIV/AIDS clinic, a foster child removal experience, @SWSCmedia Twitter debates, poetry, book reviews, and more! By the way, did you notice? Our blog has a new look! Are you a social worker or social work student who would like to contribute to our blog? Let me know!